Leeds Film Festival has awarded Best British Short to Exchange and Mart we are delighted to announce! To find out more from the directors Martin Clark and Cara Connolly check out this interview from their time at Sundance earlier this year. Hopscotch were thrilled on Sunday night to hear Monkey Love Experiments announced as the winner for the best animation at BAFTA Scotland's award ceremony. Will Anderson and Ainslie Henderson took to the stage and derided their own choice of evening wear before thanking everyone involved. "Will and Ainslie are world class animators and I'm well chuffed that BAFTA Scotland have given them the recognition they deserve." Exchange and Mart, written and directed by Cara Connolly and Martin Clark. Seagulls, written and directed by Martin Smith. Monkey Love Experiment, written and directed by Will Anderson and Ainslie Henderson. Wyuld, written and directed by Rory Alexander Stewart. As He Lay Falling, written and directed by Ian Waugh. 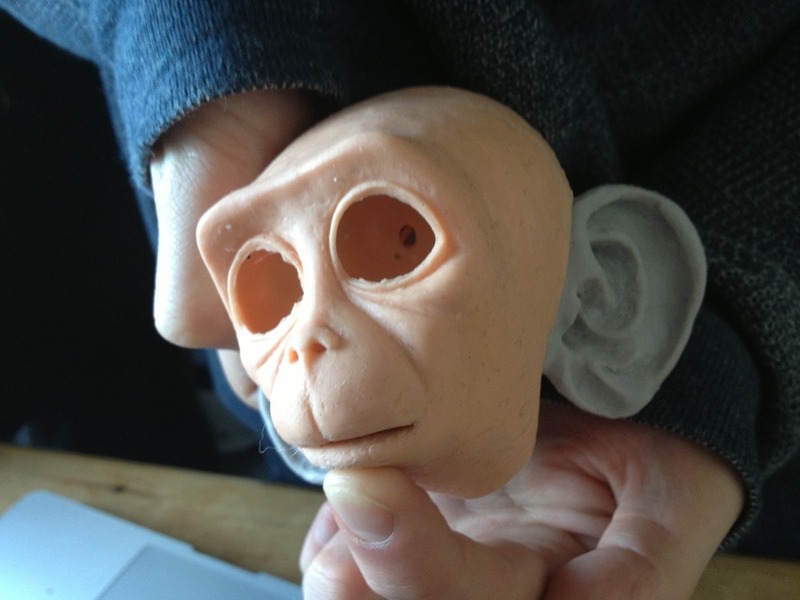 Will Anderson and Ainslie Henderson are already hard at work on their Scottish Shorts project, Monkey Love Experiments. As you can see things are really shaping up! The five teams of emerging filmmaking talent commissioned through the Scottish Shorts 2012/13 programme are announced today (01/03/2013). Directors Ainslie Henderson and Will Anderson, Ian Waugh, Cara Connolly and Martin Clark, Rory Alexander Stewart and Martin Smith will make their films with producers Cameron Fraser, Richard Warden and Jim Webster, Phoebe Grigor, Paul Ryan and Sarah Drummond. The Scottish Shorts programme is designed to discover and develop writers, directors and producers with fresh voices and the imagination to create engaging stories to share with international audiences. Films of up to 15 minutes will be produced, with budgets ranging from £10,000 to £20,000. Individual members of the commissioned teams previous achievements include: Will and Ainslie were awarded the 2013 BAFTA, Best Short Animation for The Making of Longbird; Ian Waugh’s short Strayed recently competed for the Best Scottish Short award at Glasgow Short Film Festival 2013; documentary filmmakers Cara Connolly and Martin Clark previously co-directed The Boccia Brothers, which broadcast on BBC2 in 2012 and Rory Stewart is an alumnus of the Collabor8te programme alongside Martin Smith, whose previous short Tracks garnered him a BAFTA Scotland Award for Best Short Film. The programme is a collaboration between Hopscotch Films and DigiCult, with funding from Creative Scotland and draws on the experience of producers John Archer, Carolynne Sinclair Kidd and Paul Welsh, who act as executives on the programme. These producers bring an extensive mix of talent and experience to the programme, offering invaluable support and expertise to the chosen filmmakers, helping them to create high quality projects, equipping filmmaking talent with the skills to break into features and promote their work on a national and international platform. 12 teams of emerging writers, directors, animators and producers were considered by an expert panel before the five teams were chosen. Over the last few months, the talent teams were given the opportunity to work with DigiCult and Hopscotch, plus experienced industry mentors from a range of disciplines, to develop their projects to commissioning stage. After a rigorous selection process, five films were chosen by an experienced industry panel consisting of Shian Holt (GMAC), Matt Lloyd (Glasgow Short Film Festival), Paul Welsh (DigiCult), Carolynne Sinclair Kidd (Hopscotch Films) and Ross McKenzie (Creative Scotland). "The development phase of Scottish Shorts has been really rewarding. After three months of intensive work, the standard across the slate was exceptional. It was extremely difficult for the panel to select the final five films, such was the high quality of talent in the programme. I'm sure everyone involved has a big role to play in the future of Scottish film." Monkey Love Experiments (animation/live action) Inspired by love, a misguided monkey believes he’s destined for the moon. Will and Ainslie were recently awarded a BAFTA for their short animation The Making of Longbird. Previously the filmmakers, both recent graduates of Edinburgh College of Art, have contributed on each other’s projects. This would be the first time they’ve collaborated on a project from concept stage. As He Lay Falling (drama) Georgios has come to Scotland from Greece, forced to search for work outside his country. Surviving as a woofer, he digs peat for food and board on Bronte and William’s Highland croft. A ghost in a foreign land, Georgios discovers the difference between disappearance and self-annihilation. Ian’s previous short Strayed recently competed for the Best Scottish Short award at Glasgow Short Film Festival 2013. Exchange and Mart (drama with comedy) A boarding school girl comes of age in the most unlikely of circumstances - during a self-defence exercise. Coming from a background in documentary filmmaking, Cara and Martin previously co-directed The Boccia Brothers, which screened on BBC2 in August 2012. Wiyuld (drama) A life in the day of a barmaid who works the long shift at a pub in Edinburgh’s docklands. Rory recently completed the Collabor8te programme as a writer. Seagulls (drama) When a young showman pitches up in a new town he is forced into making new friends. Seagulls explores the subtle differences in the lives of these teenage boys and how cultural bonds and barriers that are deeply ingrained are never far from the surface. Martin Smith is an award winning filmmaker whose previous short film Tracks won the BAFTA Scotland Award for Best Short Film. He recently completed Creative Scotland’s Accelerator programme where he developed his feature film script Shows. PAUL WELSH (Producer – DigiCult) Paul Welsh is a producer, developer and commissioner of live action, animated and documentary film. His features include Lore (W/D Cate Shortland, 2012) and Skeletons (W/D Nick Whitfield, 2010). Since the film's release in 2012, Lore has won 12 international awards including Best Film at Stockholm & The Hamptons, Piazza Grande Audience Award at Locarno and Critics Award at Hamburg. Through DigiCult and other routes, Paul's 50 + short film credits include BAFTA winners and nominees Tracks (Martin Smith), Dupe (Chris Waitt) and Rite (Michael Pearce). Consulting on story, script and development, Paul now works internationally with independent producers and film bodies including BFI, Creative England, Creative Scotland, Screen Australia, Screen West (Western Australia) & Screen New South Wales. CAROLYNNE SINCLAIR KIDD (Producer – Hopscotch Films) Carolynne Sinclair Kidd has worked in film and television for over 20 years, producing numerous short films which have won awards at prestigious festivals at home and internationally. She’s also produced radio drama and TV drama series, and has worked across feature film and entertainment programming. Most recently she produced a Radio 4 adaptation of the National Theatre of Scotland’s Enquirer, and is currently raising finance for two feature projects. ROSS MCKENZIE (Development Officer – Creative Scotland) Ross McKenzie is Development Officer for Film & Broadcast at Creative Scotland and a former graduate of the Media Business School in Spain. In addition to working on the production of a range of feature films, he produced 2011 BAFTA nominated short film Rite alongside Paul Welsh. He has worked extensively across the UK film industry for organisations including Capitol Films, Bard Entertainments, UK Film Council (and subsequently BFI), Paramount Pictures, The Weinstein Company and Film London. SHIAN HOLT (Business Development Manager - GMAC) Shian Holt has worked as a freelance Locations and Production Manager for over 13 years. Starting as a Scottish Screen New Entrant Locations Trainee, she has worked across drama, animation and factual production. In 2009 she won a New Talent in Animation BAFTA with Julia McLean for the animated short The Finger Trap. Currently she is GMAC Film's Business Development Manager working on youth project funding, new talent development and running GMAC Film's facility at Trongate 103. MATT LLOYD (Artistic Director – Glasgow Short Film Festival) Matt Lloyd is director of Glasgow Short Film Festival. He was short film programmer of Edinburgh International Film Festival between 2004 and 2008, and has written a history of EIFF, How the Movie Brats Took Over Edinburgh (St Andrews Film Studies, 2011). His film writing has been published in Short Film Studies, The List and The Drouth. Matt produced two festivals for Tilda Swinton and Mark Cousins, the Ballerina Ballroom Cinema of Dreams in 2008 and A Pilgrimage in 2009. He has also directed two short fiction films and one short documentary, Pollphail (2009), which screened at over twenty international festivals. Creative Scotland is the national agency for the arts, screen and creative industries.